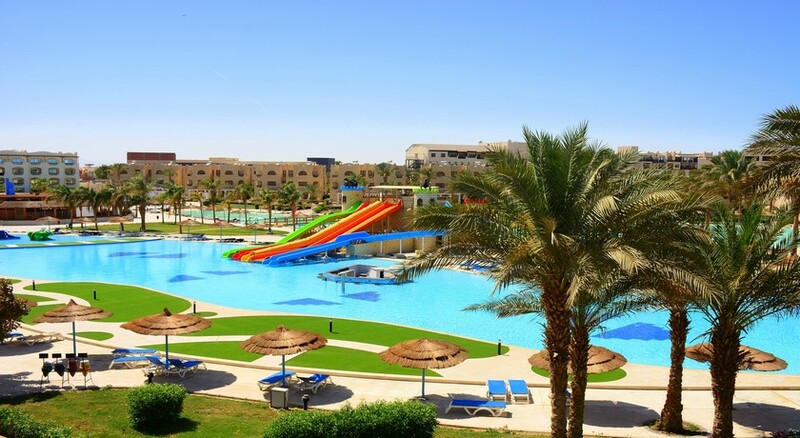 Royal Lagoons Aqua Park Resort & Spa is an all-inclusive family and couple friendly hotel located on central Hurghada’s promenade and is a few minutes from the beach. 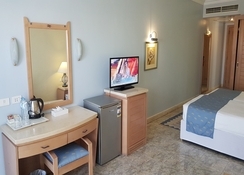 Boasting access to a private sandy beach, three restaurants and equal number of bars and an outdoor pool, the hotel invites guests to have a comfortable stay amidst excellent amenities and warm hospitality in sunny Hurghada. 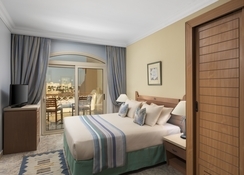 The tastefully furnished guestrooms come with air conditioning, a minibar and a satellite TV and a private balcony or terrace that offers magnificent views of the surroundings. The bathroom is fitted with a bath or shower, a hairdryer and free toiletries. 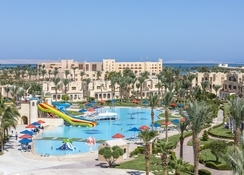 The hotel is located on central Hurghada’s promenade. The private sandy beach is only a few minutes from the complex. The Senzo Mall is 11.1km, while the New Marina is 11.5km from the hotel. Distance to Hurghada International Airport is 7.7km. 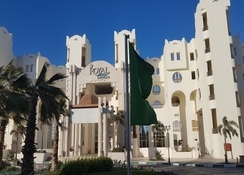 The guestrooms at the Royal Lagoons Aqua Park Resort and SPA are categorised as Guest Room, Standard Terrace Double Room, Single Room, Triple Room, Junior Suite, Family Room, Family Connecting Room, Family Connecting Triple Room, Superior Double Room, Superior Single Room, Superior Triple Room, Deluxe Double Room, Deluxe Single Room, Deluxe Triple Room, Terrace Twin Room and Pool Room. The air-conditioned rooms include a mini-bar, satellite TV and a private balcony or a terrace with excellent views. The en-suite bathroom has a bath or shower, a hairdryer and free toiletries. Royal Lagoons Aqua Park Resort & Spa has an on-site coffee shop where guests can sip hot beverages and order chocolate/cookies (additional charge). Bowl of fruit, bottle of water and wine/champagne (additional charge) can be had in room. Guests may order special diet meals (on request). At the restaurant guests can relish delicious local and international fare prepared by expert chefs from the freshest of ingredients. There is a pool bar and beach bar where guests can unwind with cocktails. The hotel also has a snack bar and vending machines for snacks and drinks. The hotel has a swimming pool, kids’ pool and terrace where BBQs can be arranged. At an added charge, guests at Royal Lagoons Aqua Park Resort & Spa can retreat into the lovely health spa, which offers massages or access the hot tub, sauna and steam room at extra charges. There is a fitness centre for those who wish to stay active. Tiny tots can have fun at the kid’s club or the playground. There’s exciting water-sports, diving and fun water activities at the beach. There is lively evening entertainment and a nightclub too.